← E-Library: Electronic or Ephemeral? Most of the courses I teach have a number of guidelines in place that allow a student to, with relative ease and fairly early on, identify if they are meeting the requirements of the course. Some of these are based around their running assessment percentages, where a student knows their mark and can use this to estimate how they’re travelling. We use a minimum performance requirement that says that a student must achieve at least 40% in every component (where a component is “the examination” or “the aggregate mark across the whole of their programming assignments”) and 50% overall in order to pass. If a student doesn’t meet this, but would otherwise pass, we can look at targeted remedial (replacement) assessment in order to address the concern. One of the things we use is often referred to as a hurdle assessment, an assessment item that is compulsory and must be passed in order to pass the course. One of the good things about hurdle assessments is that you can take something that you consider to be a crucial skill and require a demonstration of adequate performance in that skill – well before the final examination and, often, in a way that is more practically oriented. Because of this we have practical programming exams early on in our course, to resolve the issues of students who can write about programming but can’t actually program yet. It would be easy to think of these as barriers to progress, but the term hurdle is far more apt in this case, because if you visualise athletic training for the hurdles, you will see a sequence of hurdles leading to a goal. If you fall at one, then you require more training and then can attempt it again. This is another strong component of our guidelines – if we present hurdles, we must offer opportunities for learning and then reassessment. Of course, this is the goal, role and burden of the educator: not the cheering on of the naturally gifted, but the encouragement, development and picking up of those who fall occasionally. Picked correctly, hurdles identify a lack of ability or development in a core skill that is an absolute pre-requisite for further achievement. Picked poorly, it encourages misdirected effort, rote learning or eye-rolling by students as they undertake compulsory make-work. I spend a lot to time trying to frame what is happening in the course so that my students can keep an eye on their own progress. A lot of what affects a student is nothing to do with academic ability and everything to do with their youth, their problems, their lives and their hang-ups. If I can provide some framing that tells them what is important and when it is important for it to be important, then I hope to provide a set of guides against which students can assess their own abilities and prioritise their efforts in order to achieve success. Students have enough problems these days, with so many of them working or studying part-time or changing degrees or … well… 21st Century, really, without me adding to it by making the course a black box where no feedback or indicators reach them until I stamp a big red F on their paperwork and tell them to come back next year. If they can still afford it. Doing an advanced resuscitation course at the moment and it has a whole series of hurdle assessments. It’s as stressed doing an assessment as I’ve ever been. Whilst there’s a element of “measure your progress” about this style of assessment you shouldn’t underestimate the sheer fear that this sort of evaluation also carries. Which isn’t to say that they shouldn’t be used (ie, I shouldn’t be the “go to” person for resus on a surf lifesaving team if I fail to perform under pressure) but that some attention needs to be given to their appropriateness when the “perform under pressure” element of assessment isn’t needed (eg, I’m not expected to write python code under “patient’s life is in your hands” pressure). Thanks for the comment. I completely agree that hurdles can be scary – more abyssal barriers with all that entails. That’s why we go to such lengths to emphasis the availability of the opportunity to take that assessment again. To try and drop the intensity, we regularly give far more time than is required to achieve the tasks to reduce time pressure, as well as giving lead-in time and (most importantly of all) the right training that matches what will happen in the hurdle. My commitment to this is very strong because I have seen it done very badly. Here’s an anecdote from well outside of my usual area of discussion to illustrate the point. Years ago, when I was still an Army officer in the Armoured Corps (light armoured vehicles), I was about to undertake my qualification armoured vehicle gunnery live shoot (0.30 cal and 0.50 cal machine guns) to meet my Corps-specific training (Officer training is part general training and part training in the specifics of the branch of the Army that you end up in). I had performed excellently on the shoot up until then and had been praised for my vehicle control (instructions to crew and general situational awareness) as well as my shooting. Then it was announced that any breach of safety at all during this final assessment would result in an immediate fail, no retake, pack your bags, leave the course, go home, write your resignation letter from the Armoured Corps and find another part of the Army to be in. On top of that, because of the excellence of my shooting, they had put an extra observer into my vehicle – unidentified by rank or name – because the instructor thought he’d be interested to see how his students were doing. Now, yes, in live fire and especially on the battlefield, it’s essential that nobody gets hurt (except for those people to whom harm is intended, obviously). But this still sticks in my mind as just a way to raise pressure and cause more unnecessary failures than required. Perhaps I was one of the people that they wanted to eliminate? It’s possible, except that it didn’t work, in which case it was both confusing and ineffective. I suspect that it was more that some people had, without thinking, set up a stressful situation without thinking about why they were doing it. If you’ve trained people to be ready for it and assessed them as ready to go to the hurdle? Then, yes, this is a good approach. If not? 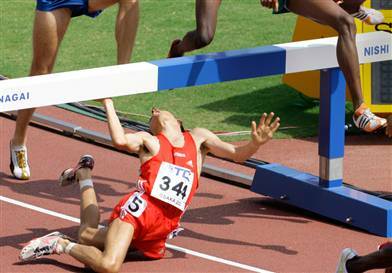 Hurdles are often used incorrectly by people who have formed a mental model of the “right sort of people” who demonstrate a set of characteristics that are often over-idealised and very hard to articulate in a way that you can train for them. So I completely agree with you on the appropriate nature and careful construction of these sorts of tests.